Mentioned by Craigslist engineer Jeremy Zawodny recently on Twitter, the development team at Craigslist pushed a new feature live over the weekend that allows users to browse listings by large photos. 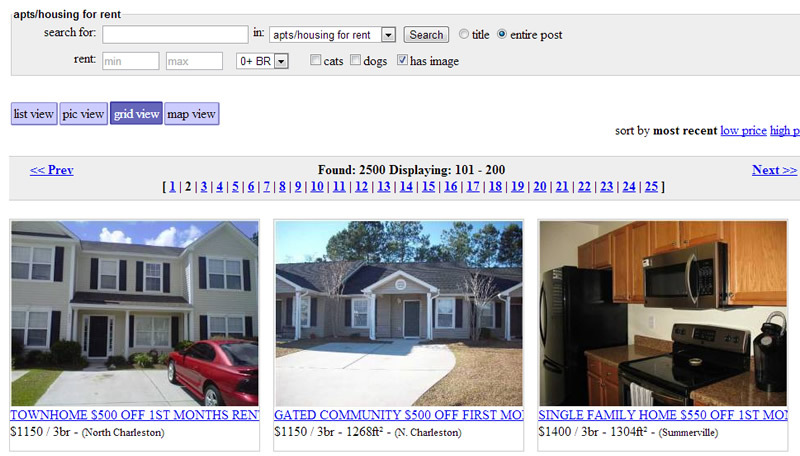 Called “grid view” on the site, Craigslist users will find the new button between “pic view” and “map view” above the standard layout of listings. The feature has been added to the housing section, for sale section, community section and the missed connections portion of the personals section. If a user is looking for a new place to live within their area, photos will likely stand out more in grid view and should attract more interest depending on the quality of the home. While “pic view” does offer small thumbnails of each listing, photos within the new grid layout are displayed at a significantly larger resolution by comparison. The photos are linked to the listing URL and the grid layout still offers the traditional minimal feel of the original Craigslist layout. At the moment, the new grid layout is only enabled on listings within the United States and Canada. The development team at Craigslist haven’t indicated if the new grid layout will be launched in other countries. On smartphones, the grid layout displays photos one at a time in a single column and the user can swipe down the page to view each listing. Taking notice of the popularity of services like Padmapper, Craigslist has quietly rolled out improvements to the layouts of product and home listings. During October 2012, the development team launched a map view that helps users identify locations of homes within their vicinity. Last month, Craigslist extended that feature to the product sections. This addition is particularly helpful for users that want to view all the yards sales within their area and plan out a route to visit a few sales over a short period.